An international research team led by scientists from the German Cancer Research Center (DKFZ) and the Hopp Children’s Tumor Center at the NCT Heidelberg (KiTZ) has identified new genetic alterations and mechanisms that lead to very aggressive types of childhood brain cancer. Their results, which have now been published in the journal Nature, will contribute to developing novel treatment approaches for previously incurable cancer cases and to targeting tumors more specifically. 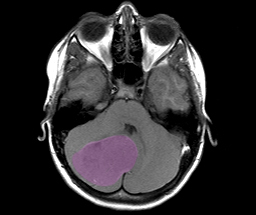 Medulloblastoma is a malignant tumor of the cerebellum. Medulloblastoma can occur at any age, but it most commonly affects children. Medulloblastomas are classified in four distinct molecular-biological subgroups that are characterized by widely varying disease courses and chances of cure. Tumors of groups 3 and 4 are particularly common in children. However, little is understood up to know about these two types. Therefore, treatment of cancers of this group is often very difficult. “Even if patients respond well to the treatment, their cancer is often being cured at high costs, because the therapy can have negative effects on the brain, the IQ and the children’s further development,” said Stefan Pfister from the German Cancer Research Center (Deutsches Krebsforschungszentrum, DKFZ), who is also the director of the Hopp Children’s Tumor Center at the NCT* Heidelberg (KiTZ) and pediatric oncologist at the Heidelberg University Hospital. An international research team under the leadership of scientists from the German Cancer Research Center has now analyzed almost 500 medulloblastomas. They discovered that these brain cancers exhibit a much wider genetic variety than previously thought. In groups 3 and 4, in particular, more than half of the underlying genetic alterations had been completely unknown until now. “While we could previously explain only 30 percent of tumors in these groups on a molecular-biological basis, we have now reached 80 percent,” emphasized Peter Lichter from the DKFZ. This finding helps classify subgroups of medulloblastoma more precisely and treat them more individually in order to improve curative chances and reduce the risk for severe side effects. Lichter said that in some cases this could already be done using available agents. “In other subtypes we now understand the genetic causes for the first time so that we can search very specifically for new therapy approaches,” said Lichter. In addition, the scientists have identified alterations at the level of gene regulation as a typical mechanism for the occurrence of medulloblastoma. In a process called “enhancer hijacking”, cancer genes frequently capture DNA sequences called “enhancers”. Structural changes in the DNA cause an oncogene that should normally be inactive to move to a different position where it is activated by an enhancer, thus promoting the onset of cancer. This work was supported by the International Cancer Genome Cornsortium PedBrain Tumour Project, funded by the German Cancer Aid and by the German Federal Ministry of Education and Research.